This work aimed to improve the surface quality and precision in machining process and speed up intelligent production. Hence, this work proposed a grinding process from a control perspective which provides a cognitive decision-making process. From this viewpoint, a new approach to measure the amount of grinding wheel wear and predict the surface roughness was designed by the authors on the basis of the compressed air measuring head and hybrid algorithms between fuzzy neural networks (i.e., ANFIS)—Gaussian regression function (i.e., GPR) and Taguchi empirical analysis. A series of experiments was conducted under different processing conditions. Results showed that the proposed method can measure the abrasive wear and predict the surface roughness accurately during Ti-6Al-4V titanium alloy grinding. The proposed model can predict surface roughness values with an error rate of 0.31% and a confidence interval of 98%. 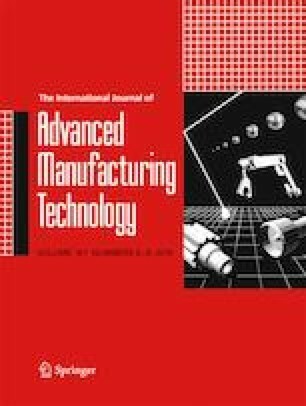 This study laid the foundation for monitoring the grinding wheel wear and the surface roughness in real-life industrial environments. This work is financially supported by the National Natural Science Foundation of China (Grant No. 51175167), and the Science and Technology Planning Project of Hunan Province (No. 2016TP1008).